Support the Crew by purchasing a tumbler to keep your drink cold for hours during a tailgate for a game or to keep it cold walking across campus to class. 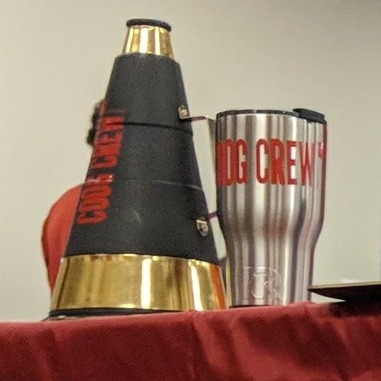 Cups are made by RTIC and have the Coog Crew logo on them. Get your towel to keep yourself cool during a tailgate in the heat or a workout in the humidity. Towels can absorb cold water and keep your head and neck cool during the brutal heat of an August day. Can also serve as a blanket for Shasta. Lost your shirt? Grew out of your shirt? Shirt now too big? Purchase a new one here and represent your organization proudly. Shirts are red with the Coog Crew logo across the front.